Our compilation of the following eye makeup tips is meant for beginners and novices as much as it is meant for those who are already pros in this game but want to sharpen their skills a little. Follow them through to avoid some of the most common mistakes that many women make when it comes to eye makeup, especially when we’re talking about eye lining, as well as applying mascara and eye shadows. Don’t forget to get the right products for you, which are easily within your reach at an affordable price with the use of Discountrue.com coupons or promo codes. – To make sure that you do not smudge your eyeliner, check to it that your eyelids are grease/oil-free. You may confirm this using a makeup remover. – To make your line as natural as possible so that it looks like it is a part of your eye, keep it as close to your eye lashes as you can. For an even more perfect look, keep your eyes open as you use the eyeliner. 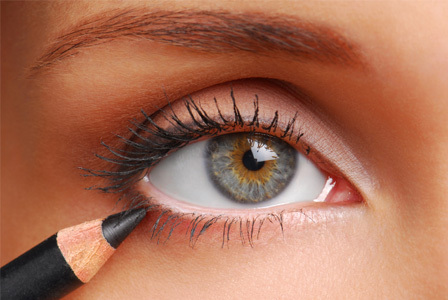 – If you want to make your eyes appear bigger, use a white pencil in your eyes’ inner rims before applying the line outside it. While the softer pencil eyeliners are also better suited for this, smudging the line using your finger makes it have a more natural look than a straight line. Softer shades are also more suited for older ladies. – While it is possible to line along your top lash line and leaving out the bottom, the vice versa is not true. In addition, the bottom lash line’s color should not be deeper than the top’s. 2. What about Mascara – To make your eyelashes appear longer, place your mascara near the roots rather than the tips. Also, prevent your eyelashes from sticking together by ensuring that you always shake the brush horizontally whenever you are applying your mascara. – Once you have applied your mascara, you can either use a clean brush or an eye lash comb to get rid of any clumps. You can use your eyelash curler either before applying your mascara or after – both should work equally well. – You can help your mascara stay on for longer by using base first. In case you fear spoiling your makeup, consider using a tissue paper for your bottom eye lash. 3. Finally, Your Eye Shadow – The most appropriate way to apply your eye shadow involves first brushing the base/lightest color on your eyes up to the brow bone, then applying the lid/medium color, and finally the highlighter or darkest color. – Be sure to always choose the eye shadow that goes well with both your skin tone and eye color. If for instance your eye shadow was the same color as your eyes, they would appear to pop out. – When creating smokey eyes, always try keeping the color to the lid and just below the lower lash line. Avoid extending it above the crease. – Know where to apply your highlight, contour, midtone and other shades according to your type of eyes. For instance, hooded and wide-spread types get applied different shades differently.